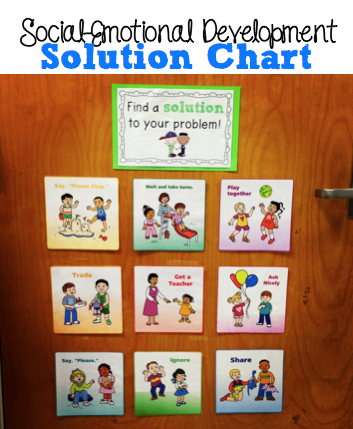 This solution chart supports my students in solving their own problems! In the beginning of the year, I introduced each solution separately by modeling a scenario and how this solution can help resolve a conflict. Eventually, all of the visual reminders went up on this door and when a conflict arose, I encouraged my students to find a solution to their problem. They walked over to the solution chart and chose a solution that made sense in that situation. I provided a lot of support in the beginning of the year in selecting a solution and eventually my students were very good doing this independently. I found this solution chart to be incredibly empowering for my students because they were able to keep the peace by solving their own conflicts and I could spend more time teaching. Win win! Vanderbilt's Center on the Social Emotional Foundations of Early Learning has some fabulous resources for teaching those crucial social-emotional skills. This website has scripted social stories that are great for teaching students how to act and respond in a variety of situations as well as ideas for teaching social-emotional skills through storybook read-alouds, among many other resources. You can find the visual reminders seen above under the Teaching Social Emotional Skills heading on the CSEFEL website. You can grab the header I made [HERE]. I've also compiled some other social-emotional development resources on Pinterest [HERE]. How do you teach social-emotional skills in your classroom?